Yellow-Billed Hornbills are a distinctive bird that is widespread in South Africa, including in Kruger National Park. They are also called 'flying bananas' because of their huge bills that are yellow and look just like bananas! 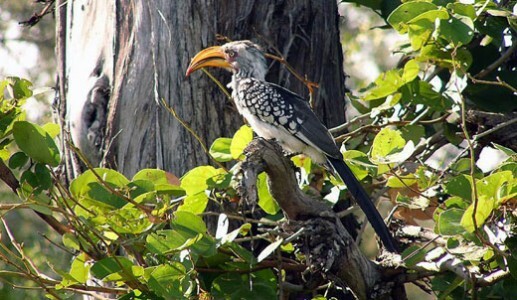 The Yellow-Billed Hornbill is widespread across South Africa, including in Kruger National Park. They are distinguished by their very large, downwardly curved yellow beaks. They feed mainly on the ground, foraging for seeds, insects, spiders and even scorpions. They may catch snakes, which they kill by bashing them on against a hard surface. They swallow their prey whole, letting indeigestable parts pass through their digestive system. Yellow-Billed Hornbills are known to forage co-operatively with Dwarf Mongooses, catching prey items that the mongooses scratch up from the ground. In return, the hornbills alert the mongooses to danger from overhead raptors. There have been reports of hornbills waiting expectantly at mongoose burrows, eager for the foraging to begin. The Yellow Billed Hornbill has a very distinctive clucking call. Once one bird starts calling, the whole group will often join in, creating a cacophony of sound. In their territory in Southern Africa you will often see two hornbills sitting together, clucking away with their wings spred out, moving back and forth and bowing their heads in display. The bird can be solitary but are also found in pairs or small groups. They are active during the day, but mostly at dawn and dusk. They roost high in trees during the night. Yellow-Billed Hornbills nest in holes in trees. They line the cavity with dry grasses and leaves. Breeding season is September to March (mainly October/November). The females seal themselves and their eggs inside their hollows with mud and saliva. Females will lay 3 to 5 eggs. The eggs usually take about 24 days to incubate and are tended to by the female, not the male. About 20 days after the first egg hatches, the female breaks out of the nest and partly seals the entrance again – a small hole is left open through which the young are fed – after a further 22 to 27 days the young birds break out of the nest. Diet: Omnivore - fruit, seeds, leaves, insects, small mammals. Habitat: Mainly savannah bushveld, dry thorn fields, deciduous woodlands, and scrubs.